OXFORD, Miss. – Underneath an early evening sunset and amid warm mid-August temperatures, four players meet for a doubles tennis match. Dressed comfortably in shorts, T-shirts and sneakers, they take their respective positions on the courts at the Country Club of Oxford. The server for the starting team bounces the ball a few times against the pavement before suspending it in one hand. Slowly drawing back the hand gripping the racket handle, the player pauses. In milliseconds, the ball is released, struck by the racket and launched like a missile over the top of the net into the opposing team’s field of range. A thud is heard as the ball hits the pavement. The ball soars across the net and strikes the pavement with a thud on the opponent’s side. These players aren’t pro or student-athletes who make sports headlines. 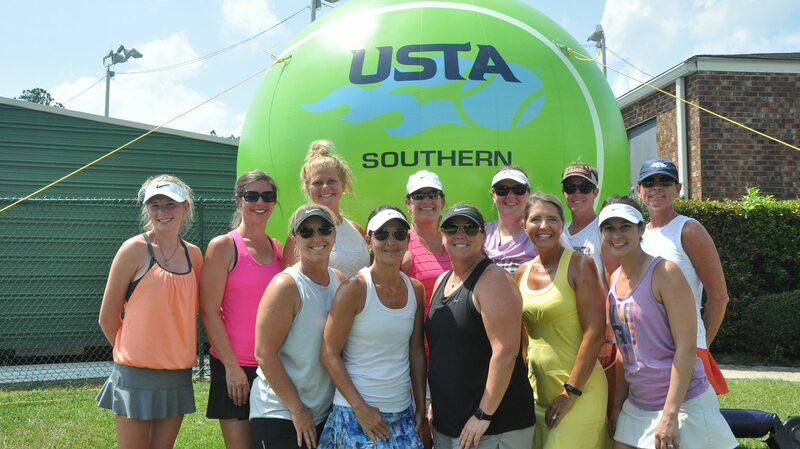 They are University of Mississippi employees playing in – and winning – tennis competitions at various levels. 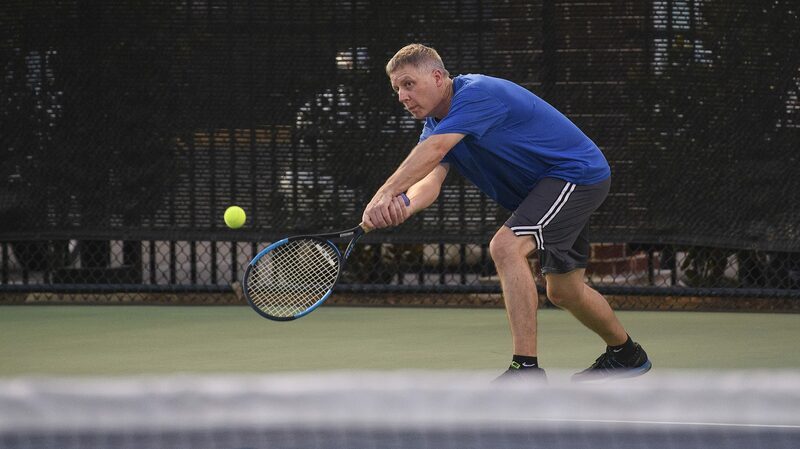 As members of the United States Tennis Association, at least 16 Ole Miss faculty and staff members regularly enter and compete within the league. League members can play a single weekend tournament or in one of the organized leagues for few months. Starting at the local level, teams from Oxford, Batesville, Grenada, Clarksdale, Tunica, Southaven and Olive Branch compete. Winners advance to a state tournament. The state tournament champions represent Mississippi in a sectional tournament, where they compete against players from Arkansas, Louisiana, Kentucky, Tennessee, Alabama, Georgia, South Carolina and North Carolina. The sectional tournament winners advance to the national tournament, competing against winners from 16 other sections in the U.S.
Paris Buchanan, associate director of marketing/fan experience for the Department of Intercollegiate Athletics, has played tennis since he was child. A state champion in junior high and high school competitions, he finds playing singles gives more ability to be in control. “The thing I probably enjoy most about the sport is it is definitely a social sport,” Buchanan said. “You can get a good workout in while playing, but also can meet new people who have similar interests as you. Mechanical engineering professor Ellen Lackey has a similar background. 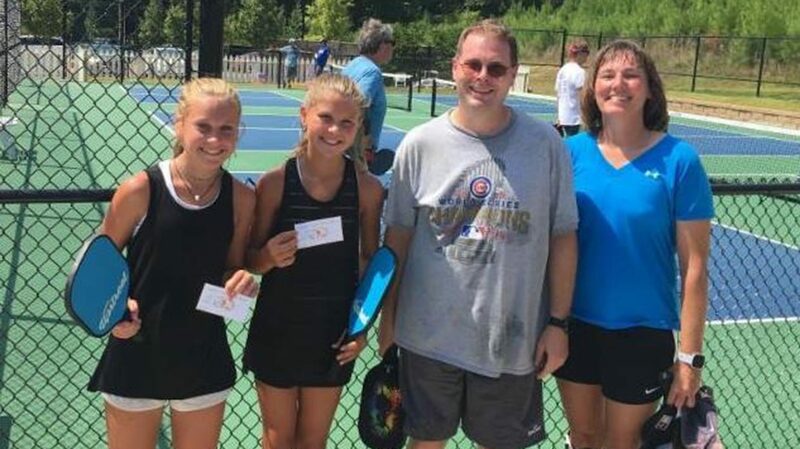 Lackey, who has always played doubles because of a hip injury in high school, has been on USTA teams that went to the Mississippi State Tennis Tournament in 2014, 2017 and 2018. She started playing pickleball (a racket sport similar to tennis that is played on a smaller court) about a year ago. “My doubles partners and I have come in third and second in recent pickleball tournaments,” she said. Praveen Panickar, a research scientist for Combustion Research and Flow Technologies Inc. (CRAFT Tech) with the aeroacoustics group at UM’s National Center for Physical Acoustics, and his wife, Marta, started playing tennis only after moving to Oxford in 2011. Both started at the lowest level of USTA play and slowly moved up. The most gratifying thing about tennis is the personal bond formed with others while still getting exercise in, Marta Panickar said. “When I started playing tennis, I didn’t know anyone in town besides my husband and co-workers,” said Marta Panickar, a research associate in UM’s NCPA. “Playing on teams, practicing and carpooling to away matches helped me to quickly make friends with people of different ages and backgrounds that I would normally not cross paths with. Brooke Whitworth, who has played competitively since 2006, identifies with Panickar’s observations. The joy of playing competitive tennis never gets old, said Kara Parham, academic counselor in the School of Education. Patrick Perry, who has played competitively for five years, said he prefers playing singles for exercise. Adam Kuffner, a communications specialist in Ole Miss athletics, agreed with Perry. Whack! Thud. Whack! Thud. The pattern continues. One quick blow follows another, each returning the ball to a player across the net. Finally, play nears an end. The grueling match is over. There are no trophies. No photographers. No crowds. The winners and the losers shake hands – all sweaty, but also happy. Everyone congratulates the others on a game played well. There are smiles as they leave the courts and head for their vehicles to drive home.